Chicago is a great city for planning your wedding. You have the choice of hundreds of venues, florists, and other vendors. The flipside is that it is overwhelming. Style is important. You want the day to reflect your personality. However, some brides are still overwhelmed. That said, you might want to consider hiring a wedding coordinator to help you find your venue. Often listed as an a la carte service, a wedding coordinator can find a venue. Last year, I had a Boston based bride that wanted to have a Saturday night wedding. She wanted the ceremony and reception in the same venue. It needed to be near a hotel since 98% of the guests were from out of town. She wanted a modern feel that highlighted the city that she loved. 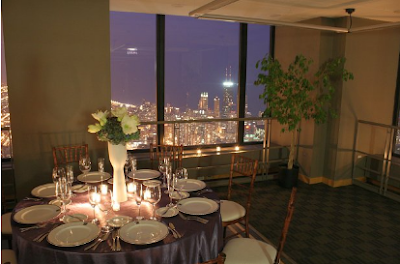 After going through her options, she fell in love with the Met Club in the Sears Tower. It was a perfect match! If you are interested in our venue search services, please contact Misse or Marilyn. We would love to help you!